I bet if you did one of those "Wordle Clouds" for all the elementary education articles out there written in the past 5 years, you'd see COMMON CORE in the forefront and creativity barely visible. On Thursday, our guidance councilor came in, in the middle of a lesson I was teaching. 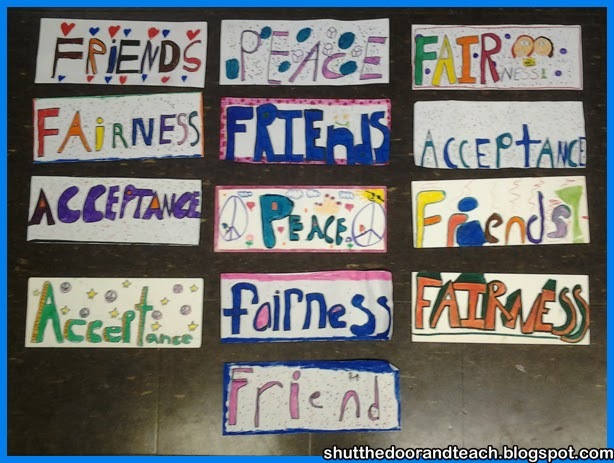 She said she wanted a few fourth graders to create mini banners with uplifting words on. She showed a sample and handed me 7 precut banners with words written lightly in pencil on the back. Of course nearly every hand went up saying "Ooooh, me, me, pick me!" Sounded a lot more fun than the instruction I was giving at the time on restating the question in an open response standardized test question. I hid my annoyance about having my lesson derailed. I asked, "When do you need them" and she said Monday. I said "Sure, that sounds fun." As she left, I put them on the shelf behind me and continued with my lesson as though there was no interruption. On the back of your paper is a word. 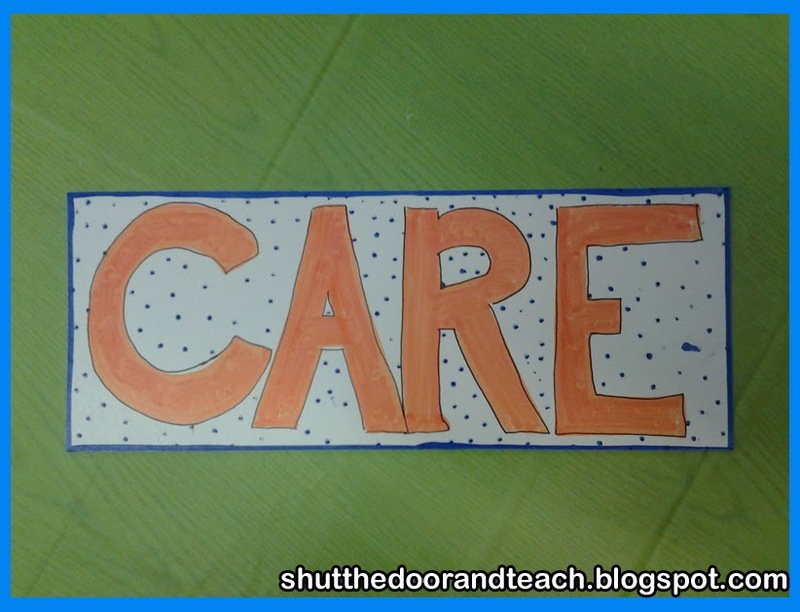 On the front, write the word in bubble letters or block letters. The letters are written in ALL CAPS. The letters are outlined in black. The letters are all the same color. There is a background design. The kids came in Friday morning and I heard them saying to others who were coming in in the second and third waves, "We get to color for Morning Work! We get to draw letters for Morning Work!" Even more exciting was when they asked, "Can we use markers?" So often I say no because it makes paper curl, but these banners were on glossy cardstock which required marker. Normally I don't even have markers for them to use, but I remembered we got a huge class set at the beginning of the year. So I opened it for the first time, and kids came up as they arrived to take one of each color and I helped bag them. It felt like Christmas morning. What happened next made the artist in me cry. As I was enjoying the quiet calm of contented coloring children, I began to hear muttering. "JOHN didn't do all the letters in the same color." "Leave me alone, I don't care!" "You're SUPPOSED to write them in all caps! Look, read the board!" "Can I get another paper?" "Is it okay if draw a peace sign for a design if my word is 'peace'?" The kids were not used to having the freedom of expression. Maybe being interrupted during a test taking lesson was EXACTLY what they needed that day. It's not like this came as a surprise to me. As early as September I could see that this group needs constant reassurance (more than most beginning fourth graders). They want the answer to come fast and easy to them. They want to know right away if it's right. And while taking pride in one's work and striving for accuracy wonderful things that some kids need more of, it can also be paralyzing. What they saw on the board was not a list of suggestions: they saw a rubric. For an art project. For a social skills initiative. For words like, "Peace, friends, and acceptance." I called for their attention. "Kids, this is an art project. It's not a math problem that has one right answer. Your job is not to check each other's work and point out what others are doing wrong, pick up an eraser, and change it so that you all have the same answer. The only directions were to write the word you are given. The rest are just things I noticed that help the word stand out clearly. The colors and designs you use are your choice! Don't criticize each other's art. 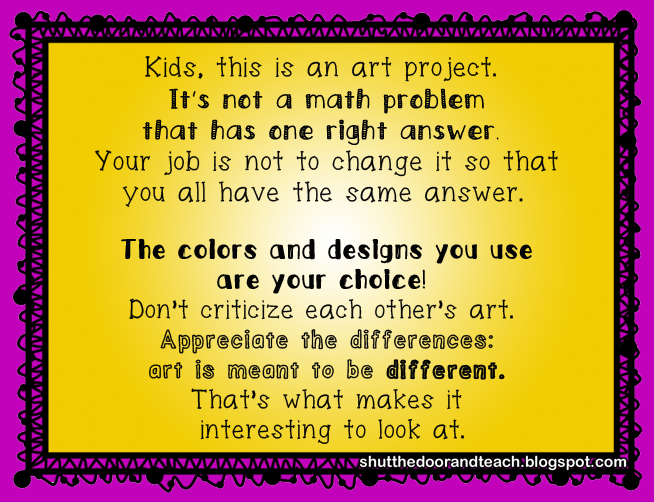 Appreciate the differences: art is meant to be different. That's what makes it interesting to look at." "I tried making shadows. It really does look like shadows." "I gave mine a border." "Can I see yours? That's really good!" "I made mine look 3D."